Up until I turned 40 I was quite skinny, even after I had my two children, I was soon back into size 12 clothes and I can honestly say I didn’t really do too much on the excercise front. Once I reached 40 it all changed and now at 57 I truly am struggling to get rid of the fat that has lodged itself permanently around my waistband. Even though I eat healthily, lots of salads, vegetables and fish it just won’t budge. So it must be my lack of excercise, not to mention the odd kilo bag of peanut kernels and very sugary fruit juices. 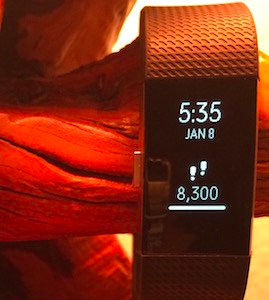 I was given a fitbit watch for christmas and for the first six months of this year it has made me walk between 5,000 to 10,000 steps every day, it has been great motivation, but then I stood on the charger and broke it (by the way It can be replaced by ordering on Amazon for a quarter of the price of the main stream retailer). Unfortunately, my motivation did disappear with regards to walking and am looking forward to recharging my Fitbit and getting back into my stride once the charger arrives. In the meantime I’ve been following a motivational young woman on facebook called Kayla Itsines, admitedly all the followers seem to be aged between 20 and 30, but … back to the power of positive thinking, age is just a number right? I’m going to give it a go, it looks like you can download a 7-day trial. I’ll let you know how I get on but if you have any tips or recommended apps on how to get motivated to do excercise and lose weight, I’d love to hear your comments.